Everyone is happening this month...I hope I can get to some of this but day job is interfering. Still, I can shoutout, no? Tonight Mad Hatter's Review is having their Friday night reading at KGB, featuring Norman Lock, Terese Svoboda, and Deb Olin Unferth. They know how to lasso the talent for these things. For info click the link and scroll down. Next Thursday, February 1, Virginia Vitzthum's book, I LOVE YOU, LET'S MEET, officially launches! Adam's Books in Park Slope, 8:00PM. Next Friday, February 2, my troubador friend John Kessel is playing Hank's Saloon (I believe this is Hank's in Brooklyn--dont' know of others). Check out his song, "Thrown Away," on his Myspace page. I love this song. Probably just the tip of the iceberg. And because I'm all over the place today, here's a crappy video of our dog Willie taking his medicine. Crappy because the sound got out of sync. I have a lot to learn. Check out the trailer my write-club cronie Virginia Vitzthum did (with some very talented friends), for her new book, I LOVE YOU, LET'S MEET: ADVENTURES IN ONLINE DATING. It features cats! And a ukulelist! Book trailers, who'd'a thunk it? I had the opportunity to read this book as it was coming to life, and it's riveting. I don't date any more (except going to the movies with my sweet hubby), and boy, times have changed. She dissects the primary conundrum of dating in the internet age--what happens when you fall in love with someone's writing, but it's not the same in real life? How does one use the resource of the internet to find compatible people, when there are too many people to choose from? Is it like shopping for humans? When does the shopping end? But too, is it good to be able to ask for what you really want? And isn't it nice to be able to craft a profile, and put art into how you put yourself out there? I can't wait to read the finished book. Hope you enjoy the musical version. Haven't decided, but I may bust out the ukulele for this one. Carol's a fellow cat person, and I do write songs about cats. And Rob appears to be a dog person, and I do write songs about dogs. Plus there's the song about the flying lion, but I can't worry too much about common ground there. If you come, bring your stuff for the open mic! Carol Novack is a long lapsed criminal defense/constitutional lawyer. Her writings can and will be found in many publications, including The Penguin Book of Australian Women Poets, American Letters & Commentary, Anemone Sidecar, Big Bridge, BlazeVOX, Del Sol Review, Diagram, First Intensity, 5_Trope, La Petite Zine, LIT, Milk, Notre Dame Review, Salt River Review, and Word Riot. Carol publishes and edits the offbeat e-journal Mad Hatters' Review, teaches innovative fiction writing at The Women's Studio Center, curates a reading series at the KGB Bar, and writes a humorous advice column for City Scoops under the nom Loopy Lulu. Anne Elliott 's poetry has been featured in anthologies including Aloud: Voices from the Nuyorican Poets' Cafe, Poetry Nation: the North American Anthology of Fusion Poetry, and Verses that Hurt: Pleasure and Pain from the Poemfone Poets. She has performed (with and without ukulele) at the Whitney Museum, PS122, Dixon Place, St. Mark's Poetry Project, and others. Her short fiction has appeared in Hobart and Pindeldyboz, and she currently seeks a home for her novel, Starving Hysterical Naked. 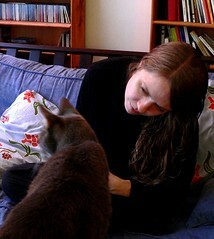 She blogs on the writing life and feral cat management at http://assbackwords.blogspot.com. Rob Stephenson is NYC based writer, composer, and visual artist. His writings have appeared in print and online in such publications as Entangled Lives, Skin and Ink, Blithe House Quarterly, Velvet Mafia, Dangerous Families, Problem Child, Best Bisexual Erotica, and Perspectives on Evil and Human Wickedness; writings will also emerge shortly in Issue 7 of Mad Hatters' Review. Rob Stephenson's first novel is forthcoming from Suspect Thoughts Press. His drawings have been exhibited at the Intersection Art Gallery in San Francisco, the Headlands Center for the Arts, the Katona Museum, and the Wexner Center for the Arts. His experimental music CD "dog" composed with Mikael Karlsson is now out on Please MusicWorks. Visit www.dog-cd.com. Sometimes I fear this sweetness will plunge me into a diabetic coma. Here's Angus playing with his new Christmas toy. And here's a boy's Nap Club struggling to keep eyes open on the sofa. I don't really have anything better to blog about. I've been writing every day, working on the new novel, ALMA, submitting stories, and applying for this and that residency, etc. I've been really enjoying the research aspect of the novel, looking at books about the theater, also spiritual stuff from AA and the Episcopal church. I'm not a believer in God, but I do find reading about it interesting, and it is proving to be the main theme of my novel, not God, but rather the absence of God, or what happens internally when one loses faith and feels like she is in the minority. So, back to work I go. Hope you all are enjoying the new year so far. I am!